Halili Knox, Myers Clark (fore), Emily Radosevich, Rafael Jordan, Akilah A. Walker (rear). Photo by David Allen. The ’60s was a tumultuous decade that Americans will forever remember for its profound effect on the direction of our history. Dominated by movements for civil and gender rights and by the new-found power of expression and influence of youth, protest for change overcame noxious obstacles and stoked hope, but also suffered failure. A number of signal events marked the decade, few more traumatic than the 150 plus race riots over the summer of 1967, especially those that charred Newark and Detroit. Dominique Morisseau’s scintillating Detroit ’67 encapsulates that tragic time through a lens that never leaves the basement of a black ghetto home over several days that July. Set near the corner of 12th Street and Clairmount, this intersection would become the epicenter of death and destruction in Detroit. For whites in America, the post World War II era had been a time of great pride with world dominance, prosperity, righteousness, and innocence. But that self-satisfaction masked profound self-serving bigotry and oppression. The African-American community was conditioned to accept “the rules” and lie low, learning to draw whatever pleasures in life privately and within the limitations placed upon them. Although grave indignities to all minorities still exist in this country, the ’60s was a tipping point to forever changing the relationship between white and black and improving the outlook for blacks. Chelle (pronounced “shell” and short for Michelle) and Lank are sister and brother living in the house of their deceased parents. Perhaps in a nod to A Raisin in the Sun, the siblings have inherited $15,000, and they diverge greatly on what to do with the money. Even given the restrictions on blacks, Chelle is happy with life – a comfortable home, money in the bank, food on the table, friends and family. Lank is a dreamer who bridles at the limits placed on him in a racist society. He schemes, always looking for new ways to prosperity. Two events of greater consequence complicate the lives of the siblings and their friends. Lank brings home a beaten-unconscious white woman, and as should be expected from the play’s title, the race riots break out. Chelle’s friend Bunny and Lank’s friend Sly round out the players in Morisseau’s incisive exploration of the clashes between black and white society and within the black community as well. Collectively, the characters reveal the conflicts in choices that are faced only by those who are subject to discrimination. If this all seems grim and weighty, much of the play deals with the joy of life, pride, and aspirations that these decent people pursue away from the threat of abusive cops and other insults to their dignity. They dig Motown music and flirt and plan parties and deal with the normal ups and downs of life. But the sub-text is always there. 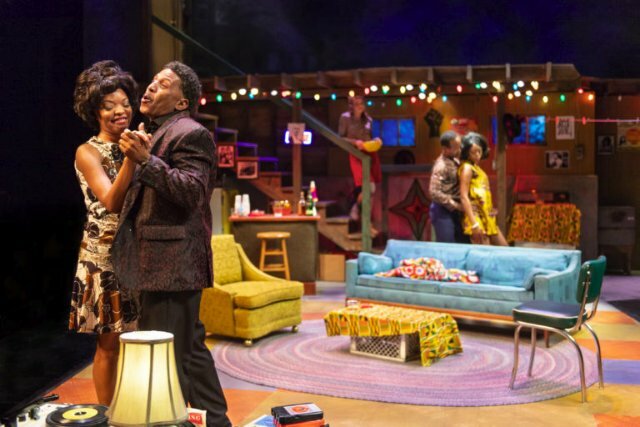 In large measure, Dominique Morisseau has become to Detroit what August Wilson is to Pittsburgh. She has authored four well-received plays of great scope in her “Detroit Projects,” demonstrating not only her love for her home town, but her willingness to delve into its complexities, unearthing its strengths and weaknesses. Detroit ’67 challenges the audience to share in the powerlessness of the marginalized there and throughout the nation. The play’s ensemble of characters led by Halili Knox as Chelle is superb. Although she can go toe-to-toe with Akilah A. Walker’s Bunny in good hearted and humorous sass, Knox plumbs her character’s grounded complexity as she wrestles with the consequences of Lank’s risky decisions. Director Daryl V. Jones mobilizes the creative team to produce an apt staging. Particular recognition goes to lighting designer Jeff Rowlings and sound designer Cliff Caruthers. Detroit ’67 by Dominique Morisseau is produced by Aurora Theatre and plays on its stage at 2081 Addison St., Berkeley, CA through September 30, 2018.